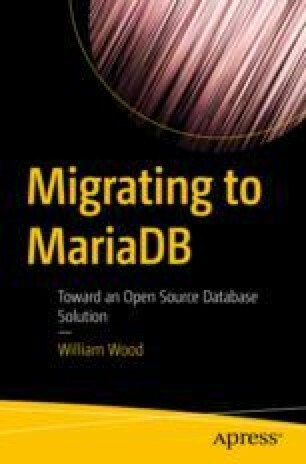 This chapter will take us through a summary of the Financial Widgets Plus (FWP) team’s work and culminate with a sample project definition with an executive summary for the team’s presentation in regard to choosing MariaDB as the new DBMS over their existing solution. Even though the raw presentation of the work completed so far speaks for itself, one may find that bringing this all together in a professionally formatted presentation should be the primary goal for any project, much less one with the far-reaching scope of migrating to a completely new database backend for a company’s premier product. As with any good analysis it isn’t just about presenting the benefits, but also identifying risks and mitigations in order to minimize those risks, along with an overall Cost Benefit Analysis (CBA), and that was Vernon’s approach.